A forelimb has been grown from the living cells of a rat. Herald Ott of the Massachussetts General Hospital in Boston and his team have taken living cells from a rat to grow a forelimb in a petri dish. This could mark the beginning of larger appendages grown from living cells, including legs and arms. 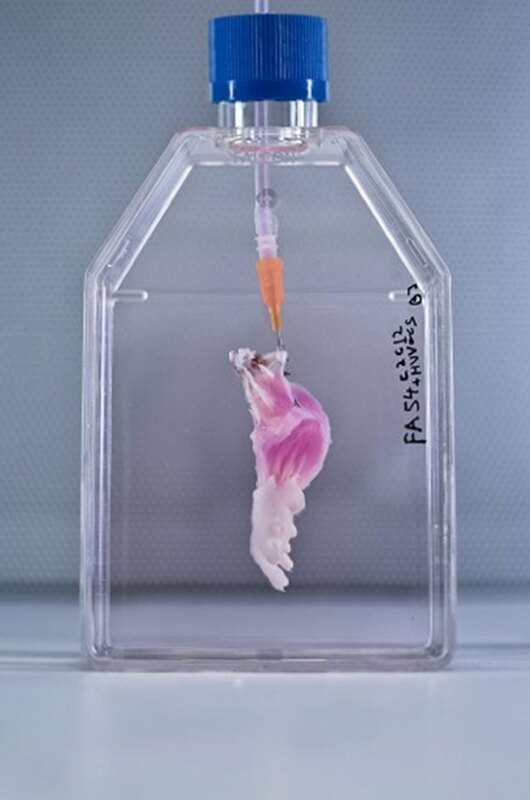 The growth technique, called "decel/recel," works through first cleaning organs from dead donors to remove everything except the "scaffold" of the organ itself. Then the living cells are introduced into the structure, to grow and fill the remaining tissue. The new limb was then put together with the help of a bioreactor. New cells were injected over time, and completed with skin grafts. To test the new limb, the team sent electric pulses through it to determine whether it reacted like a living arm. The limb could clench its fist, and similar experiements have begun on primate arms. Although living cell tissue transplants have been done with smaller tissue such as the voicebox, the full growth of a limb hasn't been accomplished until now. This could be a major breakthrough for transplanting because a transplant recipient would not have to take immunosuppressants to prevent the rejection of foreign tissue. The appendages would be cultivated from the recipents' own stem cells.